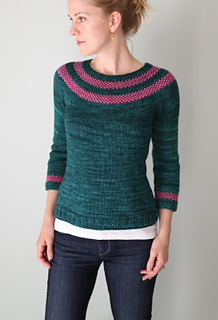 Lysa (a Swedish verb for light) is a round-yoked pullover with a simple, modern colorwork pattern. The twinkling stripes encircling the yoke and sleeve cuffs provide endless possibilities for play with color, and are a perfect way for an adventurous beginner to dip his or her toe into the colorwork pool. The sweater is constructed from the top down, in the round, with (optional) short rows lowering the front collar in a flattering way and subtle waist shaping providing for a nice fit. Sample shown in size 32” / 81.5 cm with 1”/ 2.5 cm of negative ease. Note: I used Primo Aran for the CC because a) I loved the color, b) I didn’t have it in Worsted, and c) I was impatient and wanted to start the sweater right away. Otherwise, I would have used Primo Worsted. 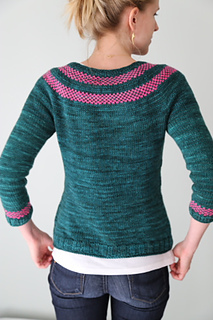 Despite the slight difference in weight, using Aran for the colorwork stripes did not impact the gauge of those parts of the sweater at all. If you have any questions, or would like to share progress or FO photos, we’d love to hear/see them over at The Yarniad’s Symposium!